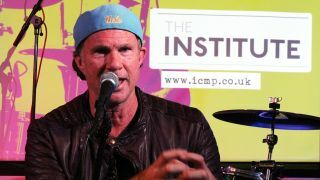 PRESS RELEASE: As the Red Hot Chili Peppers prepared to headline the coveted Isle of Wight festival over the weekend, the band's influential drummer Chad Smith made an impromptu visit to North West London's Institute of Contemporary Music Performance on Friday 13th June. Students at the Institute were surprised and excited by the visit from such a huge hero, queuing for hours to listen and jam with him. Chad took a tour of the school's premises before answering questions from the students about his career, his legendary drum off with actor Will Ferrell, and how he first met the Red Hot Chili Peppers. He spoke to the students in length about his pure passion for drumming. With a career spanning over three decades he enlightened the Institute students, made up of many aspiring musicians, with his experiences and advice about the music industry. "There are no shortcuts, work hard. You have to put the work in. Play with as many other people as you can and learn as many different types of music as you can because it will always help you to become a more well-rounded musician." He went on to talk about music education and how important he felt it was. Commenting on the Institute Chad said "You guys should just take advantage of how great this school is!" The Institute and its students were delighted and inspired by the visit, taking to Twitter to share their happiness: "Keiran Pearson (@KP_drums): Today I jammed with Chad Smith @RHCPchad at @TheInstitute. Absolutely insane!" Ian Edwards, Head of Marketing and Admissions at the Institute, said "I am so grateful to Chad for taking time out of his hectic schedule to visit us here at the Institute. Chad is such an inspirational musician and passionate communicator who is totally focussed on supporting and encouraging our students to build real careers in the music industry. " For more information about the Institute's courses and events, visit www.icmp.co.uk.